The origins of Greco-Buddhist art are to be found in the Hellenistic Greco-Bactrian kingdom (250 BC- 130 BC), located in todays Afghanistan, from which Hellenistic culture radiated into the Indian subcontinent with the establishment of the Indo-Greek kingdom (180 BC-10 BC). Under the Indo-Greeks and then the Kushans, the interaction of Greek and Buddhist culture flourished in the area of Gandhara, in todays northern Pakistan, before spreading further into India, influencing the art of Mathura, and then the Hindu art of the Gupta empire, which was to extend to the rest of South-East Asia. 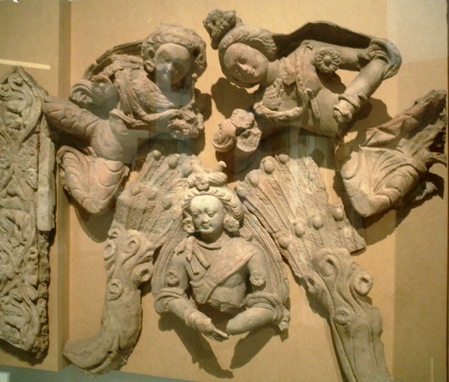 The influence of Greco-Buddhist art also spread northward towards Central Asia, strongly affecting the art of the Tarim Basin, and ultimately the arts of China, Korea, and Japan. Silver coin depicting the Greco-Bactrian king Demetrius I (200-180 BC) wearing an elephant scalp, symbol of his conquest of India. Back: Herakles, holding a lion skin and a club resting over the arm. The text reads: ΒΑΣΙΛΕΩΣ ΔΗΜΗΤΡΙΟΥ – BASILEŌS DĒMĒTRIOU “of King Demetrius”. The clearest examples of Hellenistic art are found in the coins of the Greco-Bactrian kings of the period, such as Demetrius I of Bactria. Many coins of the Greco-Bactrian kings have been unearthed, including the largest silver and gold coins ever minted in the Hellenistic world, ranking among the best in artistic and technical sophistication: they “show a degree of individuality never matched by the often more bland descriptions of their royal contemporaries further West”. (“Greece and the Hellenistic world”). Wine-drinking and music (Detail from Chakhil-i-Ghoundi stupa, Hada, 1st-2nd century AD). In Hada, Hellenistic deities, such as Atlas are found. Wind gods are depicted, which will affect the representation of wind deities as far as Japan. Dionysiac scenes represent people in Classical style drinking wine from amphoras and playing instruments. Stylistically, Greco-Buddhist art started by being extremely fine and realistic, as apparent on the standing Buddhas, with “a realistic treatment of the folds and on some even a hint of modelled volume that characterizes the best Greek work” (Boardman). It then lost this sophisticated realism, becoming progressively more symbolic and decorative over the centuries. The Titan Atlas, supporting a Buddhist monument, Hada. Later in Hada, the Greek divinity Atlas is represented holding Buddhist monuments with decorated Greek columns. The motif was adopted extensively throughout the Indian sub-continent, Atlas being substituted for the Indian Yaksa in the monuments of the Sunga around the 2nd century BC. 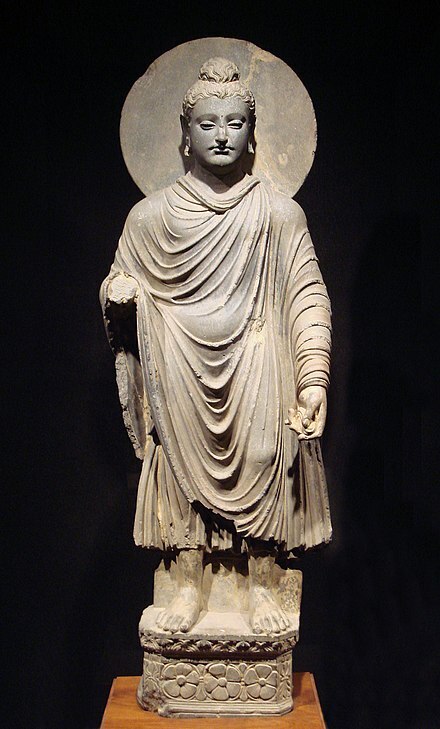 Foucher especially considered Hellenistic free-standing Buddhas as “the most beautiful, and probably the most ancient of the Buddhas”, assigning them to the 1st century BC, and making them the starting point of the anthropomorphic representations of the Buddha (“The Buddhist art of Gandhara”, Marshall, p101). The next Greco-Buddhist findings to be strictly datable are rather late, such as the c.AD 120 Kanishka casket and Kanishka' ss Buddhist coins. These works at least indicate though that the anthropomorphic representation of the Buddha was already extant in the 1st century AD. From another direction, Chinese historical sources and mural paintings in the Tarim Basin city of Dunhuang accurately describe the travels of the explorer and ambassador Zhang Qian to Central Asia as far as Bactria around 130 BC, and the same murals describe the Emperor Han Wudi (156-87 BC) worshipping Buddhist statues, explaining them as “golden men brought in 120 BC by a great Han general in his campaigns against the nomads.” Although there is no other mention of Han Wudi worshiping the Buddha in Chinese historical literature, the murals would suggest that statues of the Buddha were already in existence during the 2nd century BC, connecting them directly to the time of the Indo-Greeks. An Indo-Chinese tradition also explains that Nagasena, also known as Menander' ss Buddhist teacher, created in 43 BC in the city of Pataliputra a statue of the Buddha, the Emerald Buddha, which was later brought to Thailand. Fragment of the wind god Boreas, Hada, Afghanistan. Winged Cupids holding a wreath over the Buddha (left:detail), Hada, 3rd century. Musée Guimet. As fantastic animals of the sea, they were, in early Buddhism, supposed to safely bring the souls of dead people to Paradise beyond the waters. These motifs were later adopted in Indian art, where they influenced the depiction of the Indian monster makara, Varuna' s mount. The “Kanishka casket,” with the Buddha surrounded by Brahma and Indra, and Kanishka on the lower part, AD 127. In terms of artistic predispositions for the first representations of the Buddha, Greek art provided a very natural and centuries-old background for an anthropomorphic representation of a divinity, whether on the contrary “there was nothing in earlier Indian statuary to suggest such a treatment of form or dress, and the Hindu pantheon provided no adequate model for an aristocratic and wholly human deity” (Boardman). The Mathura sculptures incorporate many Hellenistic elements, such as the general idealistic realism, and key design elements such as the curly hair, and folded garment. Specific Mathuran adaptations tend to reflect warmer climatic conditions, as they consist in a higher fluidity of the clothing, which progressively tend to cover only one shoulder instead of both. Also, facial types also tend to become more Indianized. Banerjee in “Hellenism in India” describes “the mixed character of the Mathura School in which we find on the one hand, a direct continuation of the old Indian art of Bharut and Sanchi and on the other hand, the classical influence derived from Gandhara”. In another area of Bactria called Fondukistan, some Greco-Buddhist art survived until the 7th century in Buddhist monasteries, displaying a strong Hellenistic influence combined with Indian decorativeness and mannerism, and some influence by the Sassanid Persians. “Heroic gesture of the Bodhisattva“, 6th-7th century terracotta, Tumshuq (Xinjiang). Left: Greek wind god from Hada, 2nd century. Various other Greco-Buddhist artistic influences can be found in the Japanese Buddhist pantheon, the most striking of which being that of the Japanese wind god Fujin. In consistency with Greek iconography for the wind god Boreas, the Japanese wind god holds above his head with his two hands a draping or “wind bag” in the same general attitude. The abundance of hair have been kept in the Japanese rendering, as well as exaggerated facial features.